French postcard celebrating the Allied victory at the Battle of the Marne with the Kaiser tumbling in the river, Germans (in green) fleeing. 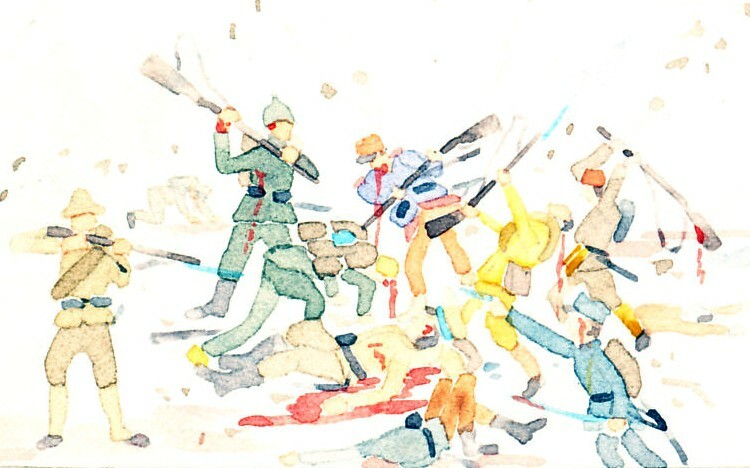 The French in blue and red advance and tend to German wounded. The British, France's ally, advance in the distance. Voulez vous que j’écrive a vos parents? You want me to write to your parents? 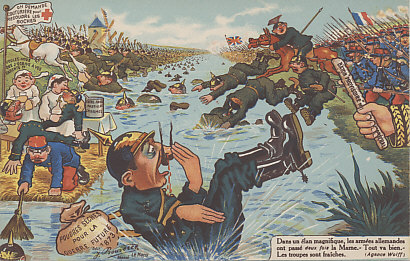 During the Aisne Offensive, THE THIRD BATTLE OF THE AISNE? On ???? the Americans counter-attack at Château Thierry on the Marne. The American 2nd Division stopped the German advance along the road from Château Thierry towards Paris, and prevented the Germans from crossing the Marne at Château Thierry. Americans counter-attacks retook Belleau Wood and Vaux, and the limit of the German advance. By June 4, the Allies had stabilized the line. Château Thierry is part of The Aisne (Blücher) Offensive, the Third German Drive of 1918.